Trunk Town is a funky place, with a population of 275 and inhabiting the historic slums of Melbourne. While now it would be populated by hungry denizens, the building that occupies the mini Trunk embassy was formerly a synagogue. Trunk is a bar, an outdoor area, a function room, a diner and a restaurant all gathered in one miniplex and linked together by pretty fairy lights and dainty brick paths. Each section is clearly stated and depending on what time of the day it is would determine where you’d inhabit. With a loose American diner feel, and subtle American diner menu, Trunk Diner features $10 wagyu beef burgers, quesadillas, fried chicken and my favourite – hoagies. And they do a mean pulled pork hoagie. 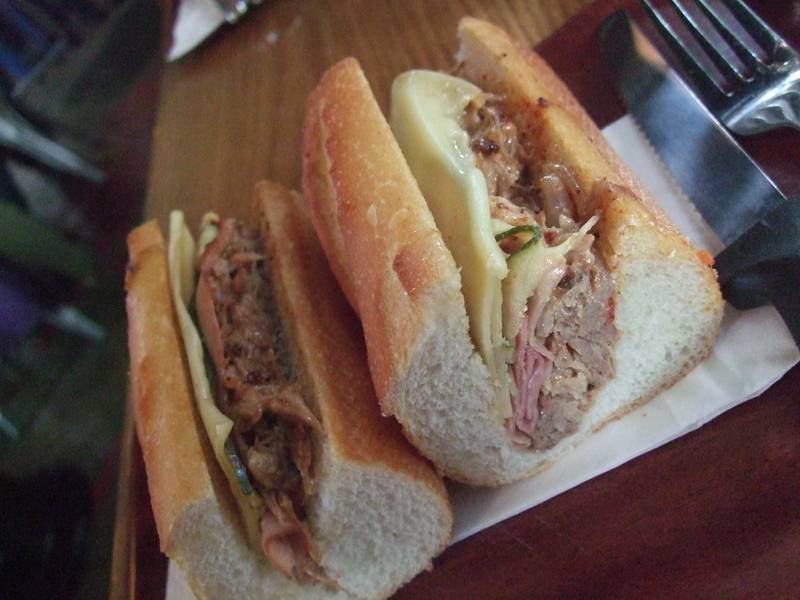 The Cuban Baguette has pulled pork, gypsy ham, guyere, pickles and chipotle mayo on a thick crusty roll. With a few drops of the green tabasco sitting on the table, this hoagie is a magnificent balance of everything right in this world. While everything else I’ve had on the menu is super tasty, the only downfall of this nice diner is the lack of staff and service attention. Anyways, who cares when they make a hoagie this good. I can’t tell you enough times how good this hoagie is. And plus, I just really like saying the word hoagie. Tags: American, Diner, Exhibition Street, Hoagie, Little Lonsdale Street, Lunch, Melbourne, Trunk, Trunk Diner. Bookmark the permalink.